Spirit Tag is flexible vinyl with a 28" beaded silver chain. Price includes a screen printed full color imprint on front side only. 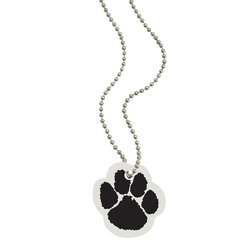 Imprint Area: 1-3/8" x 1-3/8" within paw die cut shape. Product/Imprint Colors: White with full color process imprint. Set-up: $30(G). Exact repeat set-up $30(G). Production Time: 6-8 working days after proof approval. Rush service may be available - call for details. Overruns/Underruns: +/- 5% is normal and will be billed accordingly. For exact quantity, add $20(G).